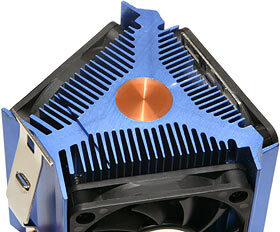 Most CPU coolers have a heat sink with a fan on top of it. Some have a heat sink with a fan on the side, or two fans moving air through the sink, or even two fans each working independently on their own separate side of the sink. My, what will they think of next? This thing's an evolution of the third design. It's made for Socket A processors, and its heat sink is split into three sectors, with one low noise slimline 60mm fan on each side, sucking air in at the sides so it blows out at the top and bottom. It carries the hard-to-trace European Connectland brand name, like the PSU tester I reviewed the other day. 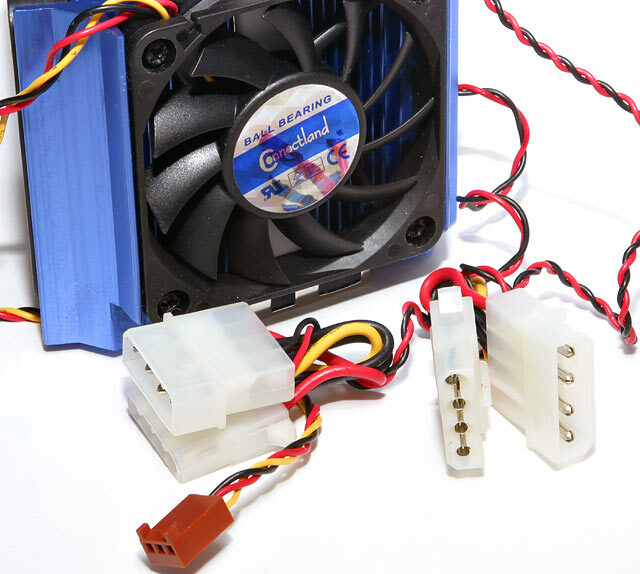 Like the PSU tester, it's sold here in Australia by Peridyme. For what it's worth, the box says this is a CEK-07-610B, and the stamping on the top of the clip proclaims the cooler to actually be a Sibak Tech product. That model number is in the same form as that of the Sibak Tech coolers I reviewed some time ago. There's no mention of this cooler on the Sibak Tech site, though, and the other Sibak site has been down for long enough that it's fallen out of Google. Peridyme sell this cooler for a rather exciting $AU93.50, which means it needs to be a solid performer. In my experience, weird off-the-wall CPU coolers only have about a 0.5 probability of working better than their more boring brethren. This ought to help. The copper core in the aluminium heat sink sits over the processor contact patch. The copper cylinder doesn't extend all the way to the top of the sink, but it's a lot more than just a coin-like inlay in the base. The heat sink's odd design means it's got a lot more metal in it than similar-sized conventional sinks. Those thick triple ribs reaching out to the corners mean that when you pick the cooler up, you'd think it had an all-copper heat sink. It weighs about 545 grams (1.2 pounds), not counting the fan cables. A cooler this heavy needs a decent clip, and this one's pretty much got one. The clip is a mildly ingenious over-the-top style, with a foam strip to stop it rubbing against the one fan it passes under, and a solid three-hole retainer on that side. The other end of the clip has one central hole and two metal pegs sticking out of the sides. I've seen retainers like this before; then, the side pegs were pretty much entirely decorative, but this clip's made of thick enough steel that they actually do something. That's good, because a cooler this heavy shouldn't be hanging from only one CPU socket hook, at either end. The clip, by the way, is a pretty stiff one, which is good news for thermal contact but could alarm newbies. You hook the clip on by jamming a flathead screwdriver into a slot in it. If you don't have a flathead screwdriver that fits the slot, do not substitute a different sized one, a Phillips head one, the end of a spoon, or anything else. Get a screwdriver that fits, or prepare to get a new motherboard. 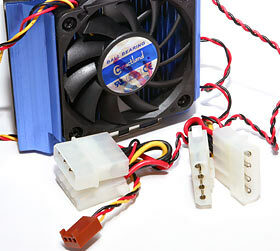 One of the fans has a normal three-pin plug, with speed monitoring wire; the other two fans run from passthrough four-pin drive power plug adapters. This is a sensible enough setup; three speed monitored fans would be nice, but a lot of motherboards don't have enough spare headers that you'd be able to plug 'em in, so you'd end up using four-pin adapters anyway. The cooler also comes with one of those little syringes of "silver" thermal grease which may or may not actually contain any silver at all. It ought to work as well as any other ordinary cheap thermal grease, though, and that's likely to be quite good enough. I wrestled the CEK-07-610B onto my CPU simulator (which is a bit taller than a real Socket A CPU; I wouldn't be worried about attaching this cooler to a real processor socket) and plugged in its multitudinous fans. There may be three of them, but they're not loud; this cooler wouldn't cut it for a real silent computing fanatic, but it definitely qualifies as a quiet cooler. Some odd-shaped heat sinks love to smash Socket A CPUs (well, older ones, anyway; new Athlons have a protective metal heat spreader), because some or all of the rubber support dots on the processor don't have any metal to push against. This sink will leave a couple of dots resting on fins rather than solid base material, but that shouldn't be a problem. Despite its quietness, the CEK-07-610B turned in a quite acceptable 0.64°C/W performance. That's a long way away from the cutting edge in Socket A cooling - the best coolers, not all of which are deafening, score down close to 0.50°C/W - but it's good enough for most stock-speed Athlons. The cooler's rated for Athlon XPs up to the 2800+ model, and I think it should have no trouble with that. 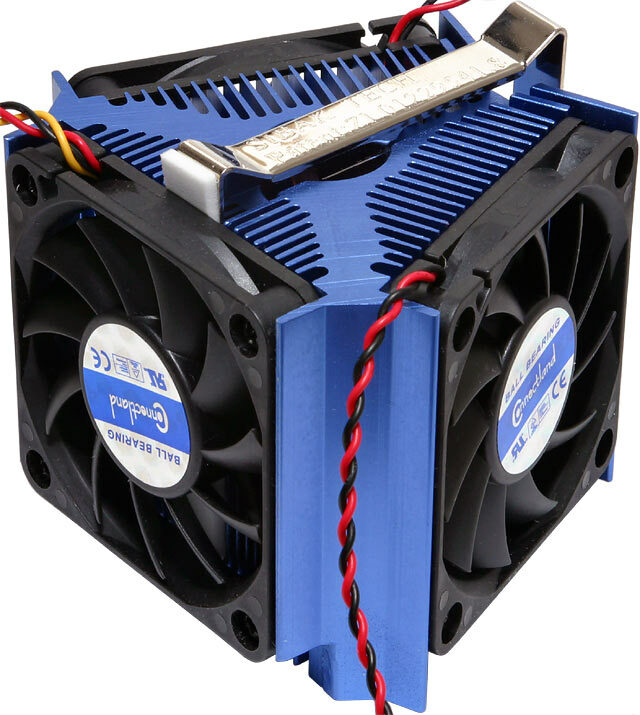 In a well ventilated case, with moderate ambient temperatures, it could handle more. Unfortunately, though, there are other coolers that work this well, make no more noise, and cost less. Thermaltake's Extreme Volcano 12, for instance (reviewed here), currently sells for less than $AU60 including delivery from Aus PC Market. The Extreme Volcano 12 also scored 0.64°C/W, with its variable-speed fan wound down to only 2000RPM - but you can also crank it up into a noisy, top-flight cooler if you like. The CEK-07-610B isn't just a funny shaped novelty. It's a perfectly good solution for cooling most Socket A CPUs, including mildly overclocked ones, provided the computer case has decent ventilation. Unfortunately, though, it's just too expensive compared with better known coolers of more conventional design. It might have a small reliability advantage - if one or even two fans fail or get jammed, your CPU might still not overheat - but CPU cooler fan failures usually announce themselves loudly before there's a big problem anyway, and you're unlikely to actually smoke a processor this way. Yes, this is a quiet cooler, but so are lots of all-copper-sink coolers with low power fans, or speed-controlled high power ones. At $AU60-odd delivered, this'd be a Recommended product. As it stands, it's Good, But A Bit Too Expensive. Review CEK-07-610B kindly provided by Peridyme.